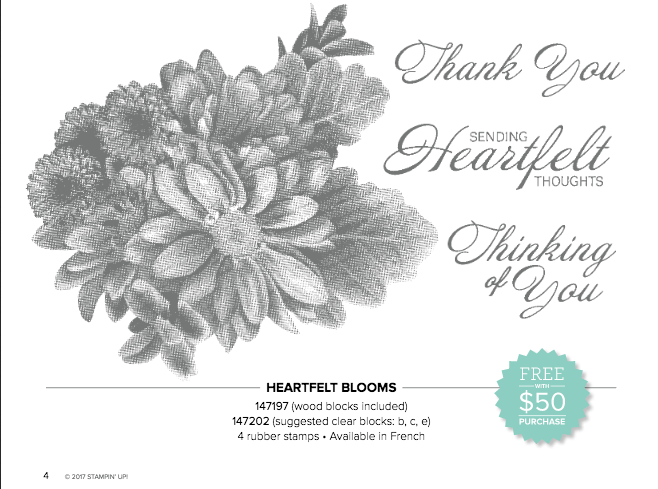 Home » Sale A Bration » Heartfelt Blooms Thank You! By Karen Decker in Sale A Bration, Thank You on January 27, 2018 . 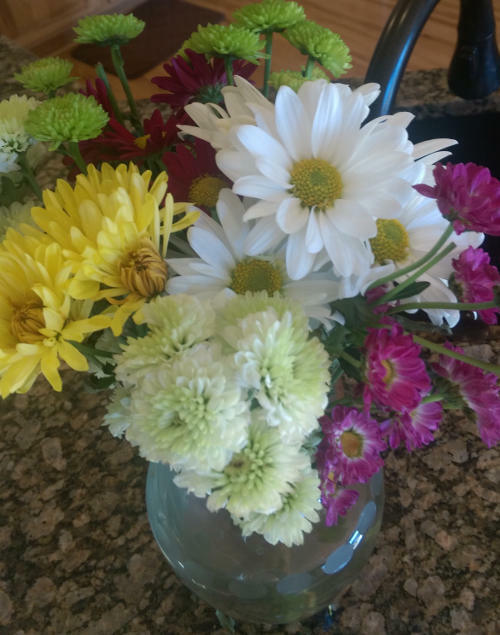 My daughter brought me “Heartfelt Blooms” and I loved how they resembled our new Sale A Bration stamp set! I didn’t realize how poorly the pictures of the cards turned out until I downloaded the images, so bear with me a bit. It looks like I have an orange filter on the camera, sigh…. the cards are gone and I can’t retake the picture. 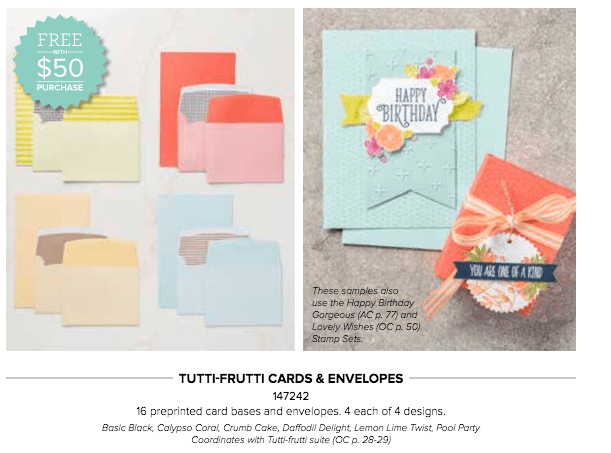 The free Tutti-Frutti card bases have a nice designer paper look, front and back, and the envelopes are colored to match with a great inside design as well. I cut the first layer at 5″ X 3 3/4″ to leave a nice designer border from the base card. 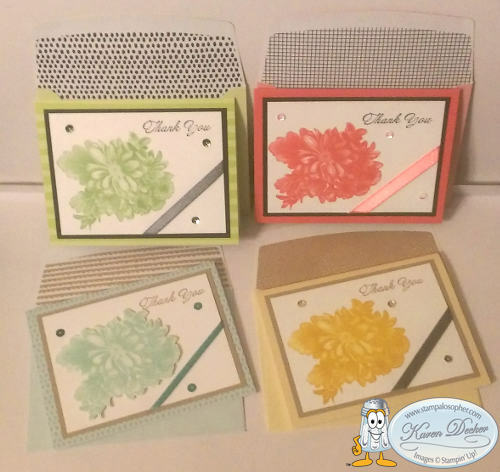 I used crumb cake to match the two envelopes that had crumb cake linings and black for the first layer on the cards with black envelope linings. The top layer is Whisper White cut at 4 3/4″ X 3 1/2″. The flowers are stamped in Wild Wasabi, Calypso Coral, Pool Party, and Crushed Curry. The Pool Party image is fussy cut and popped up for an extra bit of dimension. 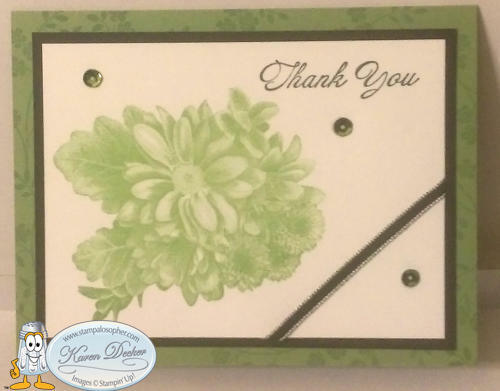 A 4″ length of ribbon and three sequins dressed up the card without taking away from the detailed flower image. 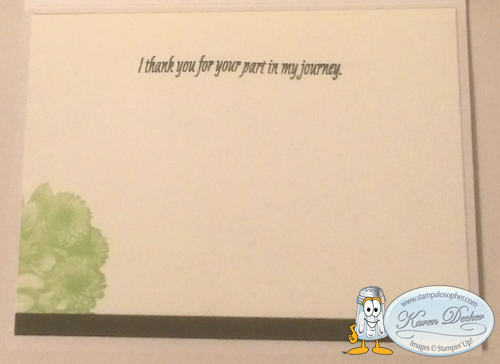 For the inside I used the greeting from Paisleys & Posies “I thank you for your part in my journey.” since without all of you supporting my business there would be no business. That little strip at the bottom is black – uh huh. Sad, but don’t you just love the little mums stamped in the corner? 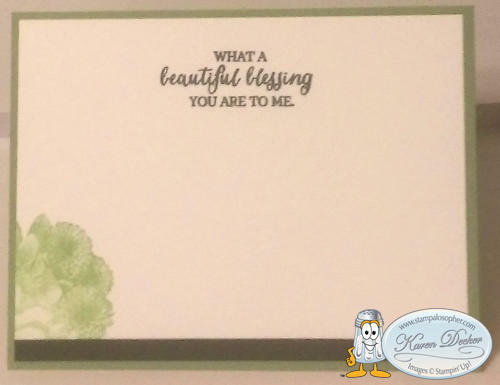 The Wild Wasabi image came out the very best so I made another set of cards using Wild Wasabi card stock as the base and stamping the edge with Versa Mark and the little tiny flowers and leaves from the vine of the Thoughts and Prayers stamp set. I am looking forward to using our new alcohol markers, Stampin’ Blends, to color the flower images! 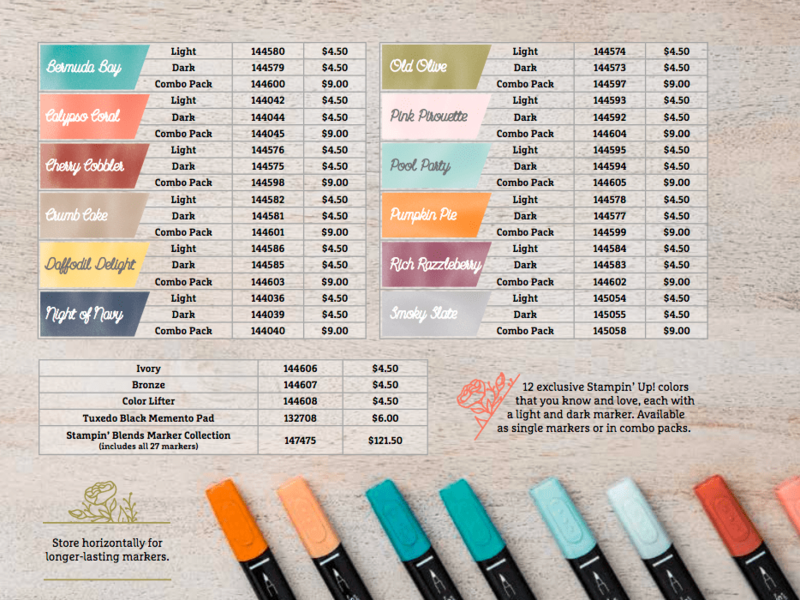 The markers are shown on page 31 of the Occasions catalog. I would love to earn your business and help you receive great Sale A Bration free products. Contact me to host a party or place an online order and earn your free products! Use hostess code VJHRB73X and receive an additional little gift from me.